Our morning started with a delicious breakfast at our Santa Barbara bed and breakfast. 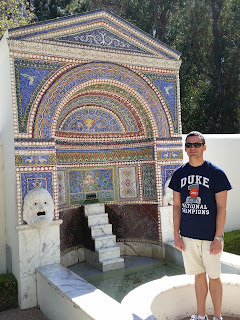 Getty Villa was our first destination of the day and was about two hours away. J. Paul Getty was an American industrialist and oil tycoon. 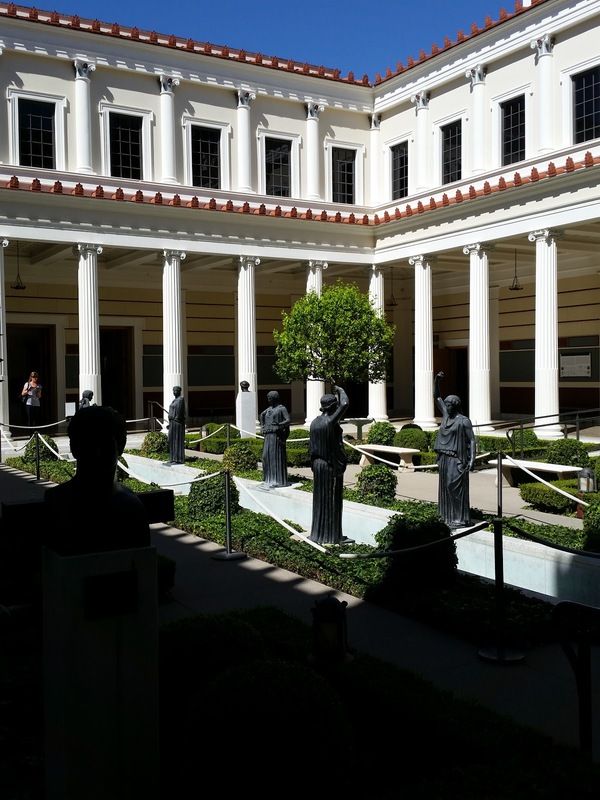 Getty Villa is an "educational center and museum dedicated to the study of the arts and cultures of ancient Greece, Rome, and Etruria. The collection has 44,000 Greek, Roman, and Etruscan antiquities dating from 6,500 BC to 400 AD." 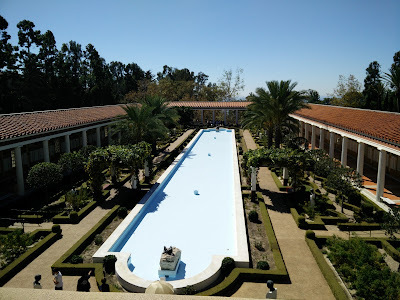 [Wikipedia] Getty Villa was constructed in the 1970s and is modeled after a first-century Roman country house also called a villa. Getty Villa is an exhibit in and of itself; there are also the art collections to browse through, the architectural elements to take in, and the gardens to see as well. There are various complementary tours offered throughout the day. We chose to do the architecture tour and I would highly recommend doing a tour if you visit the Getty Villa. They're short walking tours throughout the site and the tour guide provides a lot of information and interesting tidbits of things that you might miss without the tour. 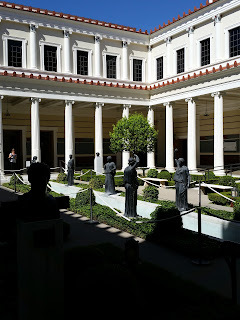 We had arrived to the Getty Villa around 11am; it took us about two hours to do the architecture tour and walk through all the exhibits and grounds. There was a decent cafe on the grounds where we had lunch. We ate and then hopped in the car for Los Angeles proper. The Griffith Observatory was definitely on our list of attractions to see in LA. Griffith Observatory is nestled up on Mount Hollywood with an expansive view of the city and surrounding area plus the Hollywood sign! Patrick would describe Griffith Observatory as a "cool astronomy museum with awesome views of LA; that's about it." 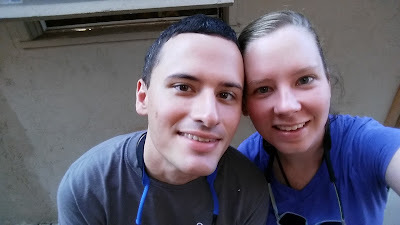 <editor's note: if you haven't been able to tell Whitney is writing all of these posts but Patrick is going into the html and fixing the pictures the way she wants them! Those were his two cents on Griffith> If we had planned an overnight for LA then it would've been really neat to go to the observatory after sunset to see the cosmos and the telescopes in action. Whenever we chatted with folks about our California road trip and what to expect we got lots of weather feedback for San Francisco - it would be chillier than it seemed and to pack lots of layers. Well I wish someone would've told us southern California was going to be hot as blazes!! I was not expecting how hot it was going to be. I was expecting warm, comfortable temperatures but it was like summer out there! Our itinerary had us walking out to the Hollywood sign as there's a trail connecting to it from the observatory parking lot. We quickly scrapped this off the itinerary due to the weather and extreme sweatiness. After our observatory visit we headed down to the glamorous Hollywood Boulevard. We parked near Hollywood and Highland so we could see the Walk of Fame, the Chinese Theatre, and the entrance for the Academy Awards. We tried to kill as much time as we could here to let major congestion pass (if that's possible in LA?!). We were hoping to catch a movie at the famed Chinese Theatre but alas the movie times didn't work out for us. 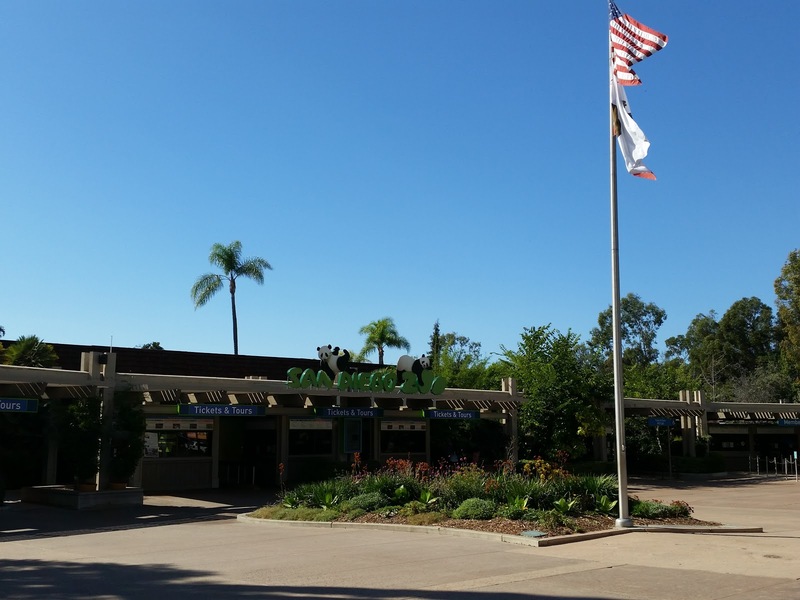 We had another late check in once we arrived in Del Mar. Regardless we were still up and ready to go by about 9am. At this point we were able to rendezvous with our wedding guest friends that had arrived for the festivities. We corralled two other couples to venture into San Diego with us and visit the famed San Diego Zoo. 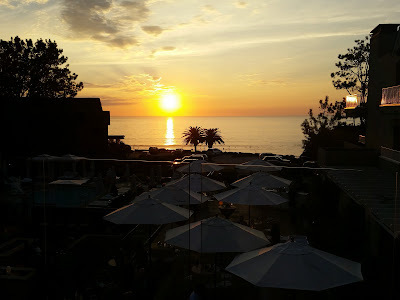 When we were planning the trip and getting ideas on what to visit from folks I would say the top attractions we heard the most were the Monterey Bay Aquarium and the San Diego Zoo. Your ticket into the zoo includes a tram ride and a guided bus tour. I had read somewhere that recommended taking the bus tour when you first arrive because it wouldn't be quite as busy in the morning and you'd get a good idea of how the zoo was laid out. I second this recommendation! Everyone in our group commented on how nice the bus ride was. We may have even seen more animals from the top of the bus than walking up to the different exhibits. 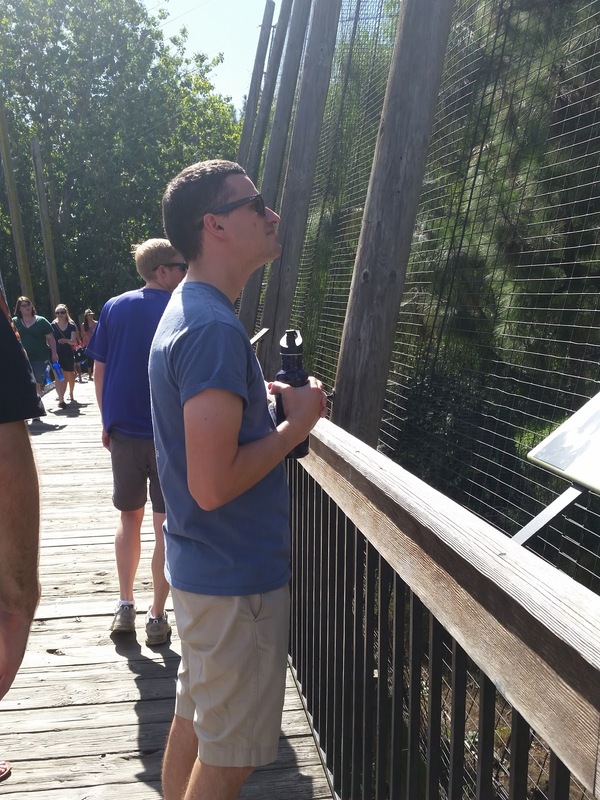 We all had fun walking throughout the zoo. It's quite impressive. It was, however, really hot! 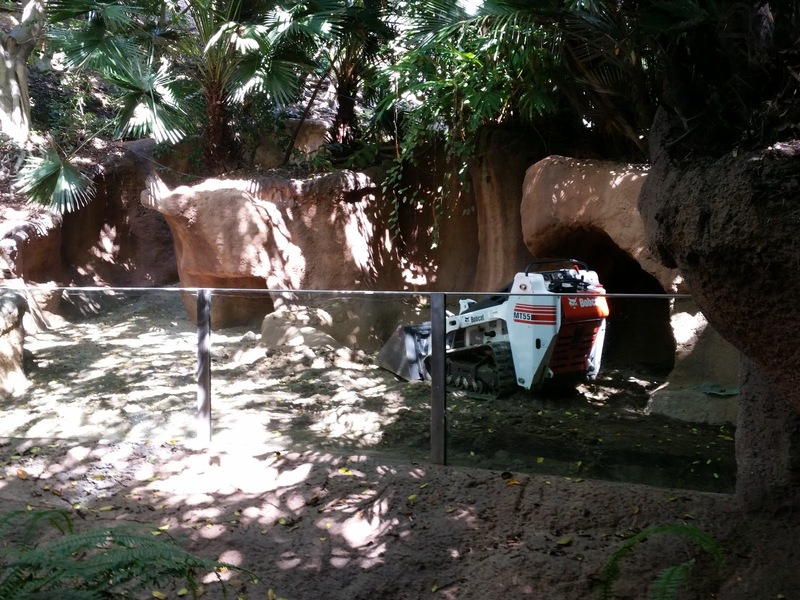 The zoo was fun to do but I'm not sure I'd put it at the top of a must-see list in California. We've all been to zoos before and this was just another zoo in my opinion. But it was large, there were lots of animals to see, there were unique exhibits, and a fun place to wander around so not a bad way to spend your time. After the zoo we came back to our hotel room for a quick swim in the pool (remember, so hot!) then we got ready for a cocktail party. The wedding was on a Sunday afternoon and the ceremony started at 4:30pm. What did this mean for us?! We had one more morning to fit in an activity! And we had saved the best for last! We had a late morning Sea Cave Kayak Tour by Everyday California in La Jolla Shores. Kayaking on the Pacific Ocean was amazing! Looking at the Pacific Ocean versus being on the water are completely different and I just thought it was really cool to say "hey look we're kayaking the Pacific Ocean". The kayaks on the tour are double seaters so Patrick and I were able to kayak together. A group of 10 kayaks are led by two tour guides out onto the waters to paddle over to view the 7 La Jolla Sea Caves. Unfortunately the rough breaking waves prevented us from entering the sea caves. Paddling along the coastline wasn't rough at all though and we didn't have any trouble paddling the kayak. Our tour guides would stop the group every 10 or 15 minutes to give a brief chat about the different sea caves and give some interesting tales about the houses and residents on the cliffs and the geography of the area. At one intersection of two cliffs was the meeting of two tectonic plates! With all that said, if you're in the San Diego area we highly recommend a sea cave kayak tour. 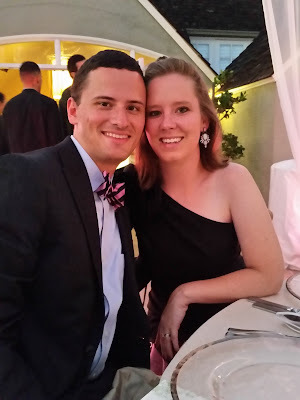 And then we got dressed up for the wedding! Then there was this beautiful sunset and it was time to go home. Whitney, thanks for doing the writing. Patrick, thanks for doing the pictures. Love it all.